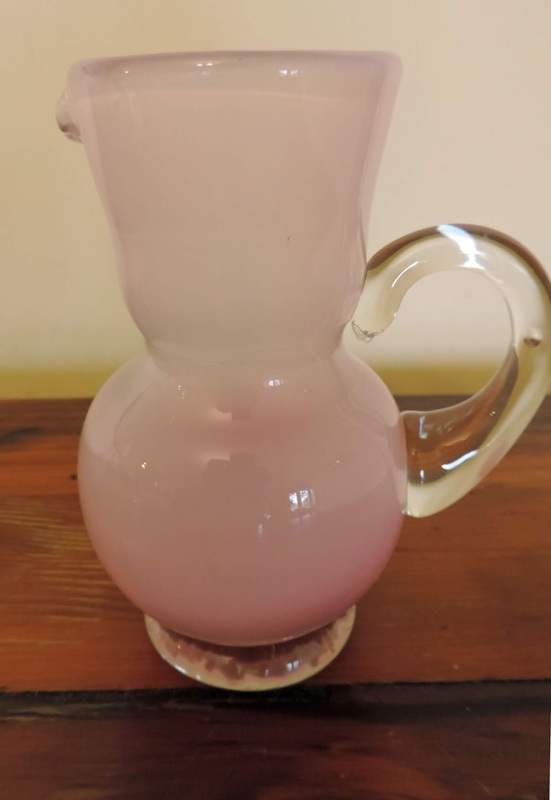 "I've attached pics of the item - 14cm tall pink jug. And also of the signature on the base. It is Australian and I think it is dated 98. I've searched many different combinations of the name but nothing came up. Can anyone assist? Thank you." Well, I didn't recognise the jug, but the marks on the base gave me a clue at once as to what it was. The word at the top is 'Raro', and at the bottom is C.Is. To the right, as Jane said, is 98. At first I couldn't make out what was in the centre, but when I asked her Jane sent me a clearer image, which showed me the initials were KM. That told me that this jug was made in Rarotonga in 1998 by New Zealand pioneer glass artist Keith Mahy. (http://newzealandglass.blogspot.co.nz/2014/10/are-these-early-pieces-by-keith-mahy.html). In my June 2013 blog I said, perhaps a little cryptically: "In 1997, Keith and others developed the Beachcomber Glass Studio in Rarotonga, followed in 1999 by a training course there for young potential Rarotongan glass artists." Jane's jug is a product of that Beachcomber Glass Studio. Those involved were Keith Mahy; his partner Shona Firman, a glass caster of considerable skill, with whom he had established Burning Issues studio and gallery in Whangarei; and Garry Nash, another pioneer New Zealand glass artist. The New Zealanders took the necessary equipment and materials to Avarua, the capital of the Cook Islands, and set up the Beach Comber Gallery. They set out to teach glassblowing to Rarotongan locals, to form the basis of a new craft industry; glass was a completely new medium for Rarotonga. As well as teaching new skills, the studio would provide a source of income from selling glass to visitors to the islands. This paperweight was made in Avarua by Apii Rangi in 1999. It is signed 'Apii Rangi Rarotonga. C.I.S. 1999'. Apii was one of those 'young potential Rarotongan glass artists' who participated in the training scheme. This paperweight was made in Rarotonga by New Zealand glass artist Garry Nash. It is signed G.N. Rarotonga Cook Islands 1998. Sadly, Beach Comber gallery and its glass training scheme was short lived, and nothing now survives, apart from pieces like these that were made there. Garry tells me that after a while Apii Rangi left and started working for himself making pearl jewellery. Footnote: Since I published this, another pioneer of New Zealand glass, Peter Raos, has commented: "The genesis of glass in Rarotonga came from a discussion I had with the Government at the time about recycling some of the waste glass that was piling up around the island. The idea was to transform it into items that could be sold back to the tourists reducing the waste. The model that was eventually tried was never going to be sustainable. A missed opportunity I think." One of the benefits of attending a conference, like CoLab 2019 Whanganui (see http://newzealandglass.blogspot.com/2019/02/colab-2019-conference-whanganui-was.html), is the opportunity to meet artists whose glass you own but whom you have never met. One of the real pleasures in Whanganui was to meet Tasmanian flame worker Richard Clements. Although we had never met, I felt as if Richard has been 'living' in my house for over twenty years. I first bought a piece of Richard's in 1989, when I attended a museum conference in Hobart - I bought this small oil lamp at the Tasmanian Museum and Art Gallery. On a visit to Melbourne in 1998, I went to see The Meat Market, an 1874 heritage building operated as an exhibition venue by the Crafts Association of Victoria (now part of Creative Victoria). I was immediately attracted by Richard's 'trophy head' of an 'Animal of Unknown Origin'. He has made quite a series of these over the years, but he tells me he found some customer resistance to the idea of a trophy head, so he stopped mounting them on a board. Mine is an early one, complete with headboard. I love its colourful quirky nature. In May 2013, this small scent bottle, missing its stopper, was listed as a paperweight on the NZ auction site TradeMe. That mark is also present on the base of the 1989 oil lamp, and on the neck of the 'unknown animal'. 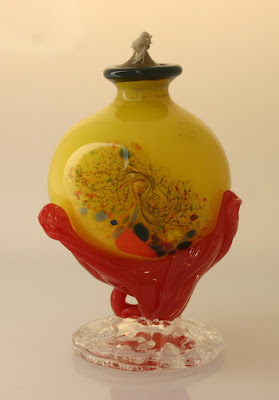 "Truly stunning piece of hand blown glass by Tasmanian glass blower Richard Clements purchased in early 1990's. A true collector’s piece. No stamp or signature on the item, however his work is very well recognised." The vendor seemed so certain that I took this at face value, and happily added another 'Clements' to my collection. However, the downside of meeting an artist is that he can say 'I didn't make that'. Which is what Richard said when I showed him a photo of this unmarked yellow lamp. Bother! If not Clements, then who made it? When I asked an Australian collector with whom I have exchanged information over the years, he suggested it looked like the work of Tina Cooper (http://www.tinacooper.com/). Having looked at her website and also listings on Australian eBay, I am sure he is right. Tina's Queensland studio was at Eumundi when she made this, though she has since moved to Palmwoods. It just goes to show you can't always believe what a TradeMe vendor says. Richard Clements was born in England, and served his apprenticeship to become a scientific glassblower, making the complicated glass equipment that research laboratories need. In 1970 he migrated to Sydney, and continued scientific glass-making there, but felt the need to broaden his horizons. With two colleagues who were also looking for something a little different, he formed a new business called Argyle Glass down at the Rocks in 1972. The trio set up a studio and started blowing glass in front of the public. 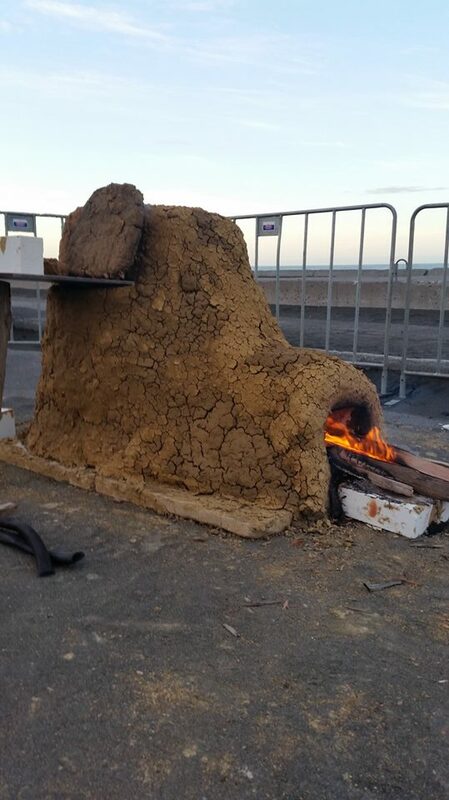 It proved to be a very popular attraction, with people crowding in to watch the process. I recall visiting Argyle Glass during a trip to Sydney in 1974 - who knows, I may well have seen Richard then. Richard worked at Argyle Glass eight hours a day, seven days a week for the first six months. After three years, Richard took a well earned holiday in Tasmania. There he discovered a little piece of paradise in Franklin, on Tasmania's southeast coast. He decided to sell his share of Argyle Glass, and relocate to Franklin, where he still lives and works today. At CoLab 2019 in Whanganui, Ausglass awarded Richard Clements Honorary Lifetime Membership, in recognition of his long involvement in glass in Australia. Congratulations, Richard. For only the second time in their history, the national glass art organisations of Australia and New Zealand have combined to hold a major international conference. Ausglass, the principal body for the promotion of contemporary glass in Australia, and the New Zealand Society of Glass Artists met for a wonderful weekend of glass in Whanganui, followed by a series of workshops. 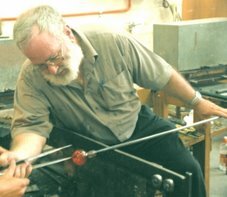 The first joint conference was held at Inglewood in Taranaki in April 1983 - see http://newzealandglass.blogspot.com/2012/08/nz-society-artists-in-glass-conference.html. CoLab 2019 was a much larger occasion, with over 220 participants from NZSAG and Ausglass, as well as international guest speakers from Australia, Canada, Germany, New Zealand, UK and USA. The theme was Collaboration, expressed in a number of ways. The event itself was a collaboration between the two national glass organisations, and several speakers or groups of speakers spoke about they way in which collaboration with other artists was a feature of their glass practice. To celebrate the theme of Collaboration, the chandelier masters Crystal Chain Gang (Leanne Williams and Jim Dennison) - with lots of help! - made a collaborative chandelier for The CoLab Conference. NZSAG and Ausglass Members were collaborative partners in this exciting project, making myriad elements to create a dynamic, illuminated and unique collective work of art glass. The finished piece was on exhibition at the Sarjeant Gallery over the course of the conference. The project could not have been realised without the generous support of NZSAG, Ausglass, The Sarjeant Gallery and New Zealand Glassworks. These are some of those who collaborated in making the CoLab Chandelier. The Sarjeant Gallery hosted the NZSAG / Ausglass Members' Exhibition, always a conference highlight, and a number of well deserved prizes were awarded, with Whanganui Mayor Hamish McDouall making the presentations, under the watchful eye of the Presidents of the two organisations. Carmen Simmonds (NZSAG, left) and Kate Nixon (Ausglass) reading out the prize winners' names. Mayor Hamish with Anne Robinson (above left), Sue Hawker (above right), Lee Howes (centre), Keith Grinter (below left) and Richard Clements (below right). As a way of engaging the Whanganui public, but also because it was fun, a team of glassblowers went back to (nearly) the beginnings of glass-making, re-creating on the Castlecliff foreshore a wood fired Roman style glass furnace. Sui Jackson from Australia led a team in building an adobe furnace; a simple, wood fired construction that could be built quickly and cheaply from locally sourced materials. 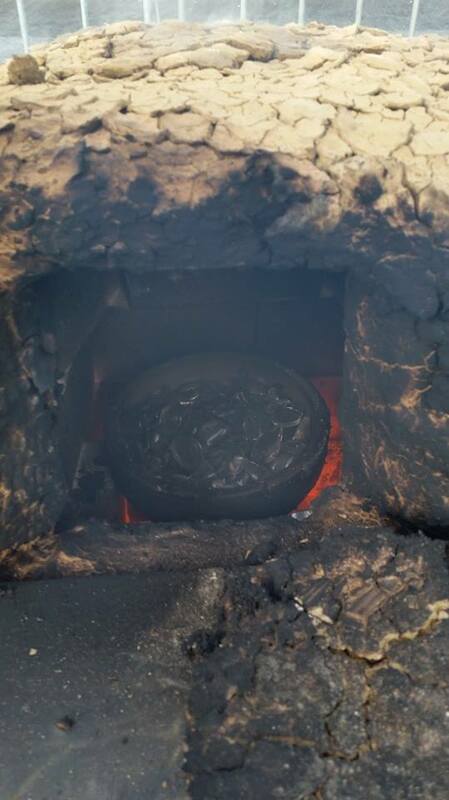 Throughout the afternoon public demonstrations from local and international glass blowers showed just what could be done when working in this primitive style, sometimes using a 2 piece mould made from pumice found on the beach. Each year the Trust Board of the Auckland War Memorial Museum recognises individuals who have made significant contributions to museums in Aotearoa New Zealand. I was one of four recipients recognised in 2017. I was delighted recently to attend a reception at the Museum to receive the award of Fellow of the Auckland War Memorial Museum. The medal was presented by Dr William Randall, Chairman of the Museum Trust Board, and Dr David Gaimster, the current Director of the Auckland War Memorial Museum. I was the Museum's Director from 1979 until 1993, which was the reason for the award. That's great, Stuart, I am sure I can hear you say, but this is a New Zealand Glass Blog, not a place to show off awards, and that Medal is not glass. You are right, of course, it's not glass, but there is a significant glass connection. The Auckland War Memorial Museum Medals are made by Auckland sculptor John Edgar ONZM, who has made 45 of these Medals over the past 23 years. They differ slightly from year to year. John tells me mine is made from black argillite or pakohe from Mokomoko Inlet and green argillite from Green Hills. Both deposits are found in quarries on the road from Invercargill to Bluff, quite close to each other. The engraved band around the edge is aluminium, and the Medal is set in a wooden case. But no glass. The glass connection is in the wonderful series of similar medal forms, 'Coins of the Realm', that John Edgar has been creating for over 35 years. He began the series in 1982 and it is his stated intention 'to mint 1,000 distinct tokens for Aotearoa New Zealand'. In his sculpture John often contrasts the opaqueness and density of rock with the transparency and lightness of glass. Many of his works allow light to pass through the rock. This 'Calculus' or counting stone is one of John's series of 'altered pebbles'. I purchased it in the early 2000s. The greywacke pebble has been sliced, with slivers of glass inserted, so that something intrinsically dense and opaque has bands of light that pass through it. He has said that these pieces are his 'attempts to recombine that which has been divided, the transparent parting of the solid, seeing into the heart intact'. I greatly enjoy these glass and stone sculptures, and I am now delighted to have an Auckland War Memorial Museum Medal to display with them. In my blog in November 2016 [see http://newzealandglass.blogspot.co.nz/2016/11/fred-daden-and-tony-kuepfer-at.html ], I wrote about the wonderful archival film that has recently been resurrected through the NZ Society of Artists in Glass archiving project. In March 1977 English master gaffer Fred Daden came to Inglewood in Taranaki at the invitation of then almost beginner Tony Kuepfer, to show Tony some of the skills of the glass-maker. The film shows Fred repeatedly demonstrating how to make a wine goblet, and especially how to make the foot. Quite out of the blue I was recently offered a decanter and four wine glasses. Together with a set already in my collection, they demonstrate beautifully how much Fred taught Tony, and indeed how good a student Tony was. 'Yes, I am fairly sure they are mine… very early mine, before I brought Fred Daden down. They would be pre-1977. 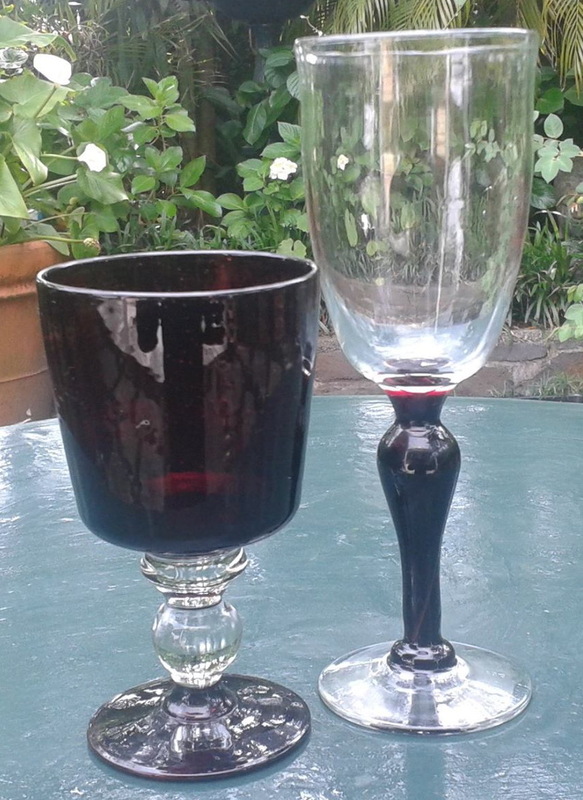 I was still very green then and only knew how to make feet for goblets by dropping a gather of glass on the marver [a flat iron plate], a quick flatten then pick it up on the stem. The design on them also is one I have done. Very thick and chunky they are. Also, I didn’t know about or use the cross pontil mark until Fred showed me, hence the more solid mark on the bottom. All of which is very illuminating, and explains the chunky appearance. In the March 1977 film Fred Daden demonstrates how to make a goblet foot, and it doesn't involve the use of the marver at all. A 'blob' (technical term!) of glass is applied to the bottom of the stem. with a finishing touch from a wooden paddle. Tony made the set of goblets below after Fred Daden's visit. He had learned both the technical skills from Fred, but also a great deal about the aesthetic of goblet making. These goblets, with the decanter below, were purchased from an exhibition Tony held at the Canterbury Society of Arts in 1978 or 1979 (he had one exhibition in each year). The matching decanter is typical of Tony's work after Fred's visit, and very different from the early 1975 or 1976 one seen at the beginning of this blog. It has a solid stopper, which is better both visually, and also allows a better seal in the neck. 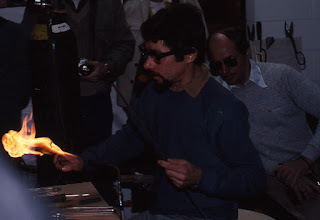 In March 1977, English glass gaffer Fred Daden came to Inglewood, Taranaki, at the invitation of Tony Kuepfer, where he spent a month showing Tony the finer points of studio glass technique. During its archiving project, two reels of colour 16mm film were located by NZ Society of Artists in Glass amongst the files of Mel Simpson, a founder of NZSAG and formerly Lecturer in Glass at Elam School of Fine Arts at Auckland University. At that stage, Mel was not sure what the film showed. The two reels were joined into one and transferred to DVD, to make it more accessible, but since there is no sound, no titles and no credits it wasn't until it was shown at the NZSAG Conference in Auckland in October 2016 that it was recognised for just what it was. Auckland glass artist Peter Raos was at Inglewood in 1977 and also at the 2016 Conference, and he at once recognised it. Stuart Park, glass blogger, also knew that Fred had been at Inglewood, and recognised Tony's studio. Excited discussion ensued, and the story of the film and its making emerged. 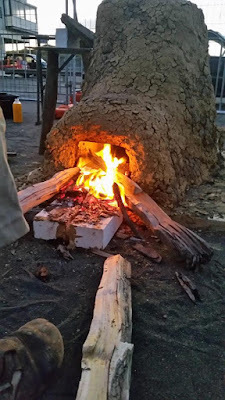 This blog has been compiled by Stuart Park, with considerable assistance from Tony Kuepfer, Mel Simpson and Peter Raos. Mel paid for the film stock, and an Elam film enthusiast, Wilton Roger, shot the footage for him. Acknowledgements too to NZSAG, especially then President and Secretary Heather Oleson and Lisa Mak. Tony Kuepfer was born in Oregon in 1947. After doing a business degree at the University of Portland, he discovered the small glass course running at Portland State University, and spent two and a half years working in the glass studio. In Oregon, he met Carolyne, a Kiwi, and decided to come and spend a year in New Zealand, arriving in December 1973. But 4 months earlier, in London, he had met Fred Daden, who was Technical Tutor in Glass at the Royal College of Art in London. Fred had been a top gaffer in the English glass industry, at Whitefriars, when RCA pulled him in to teach in their glass programme. In New Zealand, Tony decided to make glass. He went to Taranaki in March 1974 – some friends had mentioned the old church at Inglewood. He went to see the Council, to arrange access to gas, because the church was outside the gas franchise area. They said this would be OK, but the Gas Corporation said no, saying he was too small a user – this was the era of Think Big, which had tapped into vast reserves of natural gas. That led to nearly a year of negotiation. Tony took out a business development loan, conditional on the gas being agreed, and used that as leverage to get approval for the gas. Gas came on early in 1975 – prior to that he was making stained glass lampshades. Tony made his first hot glass in NZ in 1975. In 1976, Tony was invited to attend the first international conference on hot glass at the Royal College of Art in London, so he renewed his contact with Fred Daden. At the conference Tony became aware of the distinction between the American approach to hot glass, where technique was not highly regarded, and the English approach in which technique was seen as the most significant, and of which Daden was a master. He realised that he would benefit enormously from working with Fred. So in March 1977, at Tony’s invitation, Fred Daden, accompanied by his wife Barbara, came to spend a month at Inglewood. Tony described this month as being equivalent to the amount of glass making he would have had in a yearlong diploma course. Tony says he learned a great deal from Daden, technically, especially how to make glass move – “a good piece is a fast piece”. In the film we see Fred Daden making glass at Inglewood, goblet after goblet, as well as some other objects. The camera lingers on his flowing hand movements, keeping the pipe and the glass moving continuously, in the way all master glass-makers move. Fred is the rather elegant gaffer, hair brushed, in well ironed shirt and tailored trousers. Tony is his ‘punty boy’, long haired, mustachioed and wearing rather short shorts. The contrast between the American and the Englishman is plain to see, but importantly, they had become, and continued to be, close friends. The Englishman is passing on the skills and techniques of the English glass tradition to this, at that time relatively unskilled, American. "Fred is captured making several items and if you are not a glass blower it might seem a bit random. At one point he is making a clear wine glass with a drawn stem which includes a 'tear drop' bubble in the stem. We don't see the step where he sets that up but you can make out the bubble in the stem when the piece is near to being put away. Other drawn stem pieces show up at the end on the product shelf as air twist wine glasses. Fred knew how to make these but he had to practise; they got really fine and elegant towards the end. He is also shown making the cast on stem wine glass with a single bit as well as the more bucket shape bowl with multiple bits making up the stem. These multi bit stems are really tricky and Tony's glass was quite a soft formula, so you see Fred chilling those bits with the tools to keep it all straight. The use of the calipers to measure the bowl and the stem to create a standard height for sets of glasses also shows his training for making multiples of the same design in a run of production. 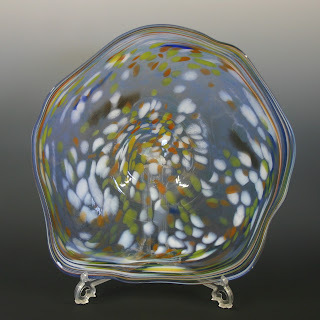 "The trailed glass platter is employing one of the oldest known decorative effect in glass, the hooked trail, which goes back several thousand years. Fred would have been shown many things in his career as well as working out new approaches to making things and all this knowledge is passed on by doing and watching others do. He came to NZ at a time when we knew pretty much nothing. "Fred came from the apprentice system where all the kinks were ironed out over the years and you eventually earned your place as the gaffer and the servitors did what you told them. He said that the office would send down drawings and they would figure out how to make the piece on the shop floor. Then they would set about producing that piece until they were told to stop. "The bench or glassblower´s chair was made to Fred´s specifications [with its unusually long arms]. I had forgotten how he parked his jacks on the arm like that. We copied that move for a while but I kept burning my forearm on the hot blades, it was just a personal style thing that he did I guess." Thanks for those comments, Peter. There are a few other people in the background of the film. We see a second cameraman briefly at one stage, and there are the legs of people with different coloured trousers than Tony’s shorts. Peter Raos identified the punty boy who assists at 22 minutes 25 seconds onwards as being Howard Tuffery, now a noted Taranaki sculptor in stone and wood, who was assisting Tony in the studio at this period. Peter Raos was one of a group of 3 students from Elam, who set off in Mel Simpson's car on a field trip to see Fred blow glass. Peter has 2 wine glasses he purchased at the time, signed F. Daden 1977. As an exercise Peter and Mel sketched pieces and asked Fred to make them. Perhaps as a challenge, Mel drew a complicated double handled piece with a separate lid. Fred said he didn’t like it, particularly the foot detail. However he simply got stuck in, making Mel his punty boy. Mel describes nervously bringing globs of glass to Fred and says the piece turned out absolutely exactly as he had drawn it. ‘Amazing - he was very clever craftsman indeed’, Mel said. Peter Raos, too, sketched a piece that Fred made, which he still has. Peter notes that they must have stayed overnight because the pieces he made from the drawing had to be annealed. In the film we see Tony putting pieces into the annealing oven several times. There's an interesting small technical detail from 10 minutes 27 seconds onward. Fred uses the handle of his tongs to make the first of two cross marks in the nubbin of glass on the pontil that will be used to pick up the finished object, a technique that leaves a distinctive 'Maltese Cross' punty scar. The purpose is to provide a weak point where the object being made will snap readily off the pontil, reducing the risk of breakage. 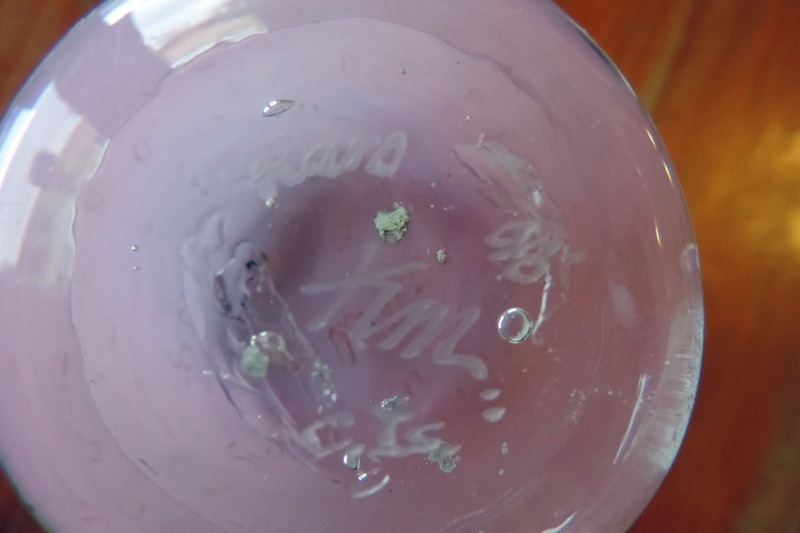 This scar is often used by collectors to distinguish Tony Kuepfer's post Fred Daden glass, though Tony (and Fred) were by no means the only glass artists to use this method. At the end of the film the camera spends some time looking at glass objects being offered for sale in Tony’s studio, some made by Fred Daden. These include many objects recognisable today as typical of Tony’s early production, including a platter such as we see being made in the film, and wine glasses, including some air twist stem glasses. There are also mugs, which Tony says Fred showed him how to make proper handles for and achieve an even thickness. I have included images here of pieces from my own collection which closely resemble pieces seen in the film. This air twist stem goblet is signed and dated AWK 92. See the air twist stems in the 1977 screen capture as well as Peter Raos' comments above. The lessons Tony learned in 1977 have stood him in good stead over the years. 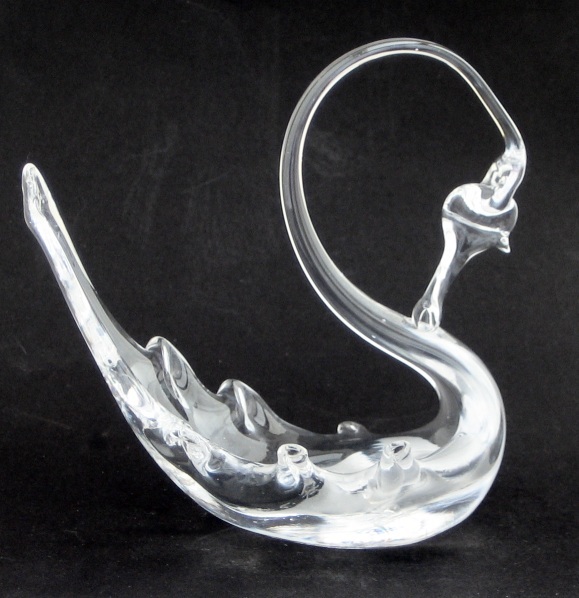 English studio glass artist William Walker was a student at the Royal College of Art from 1977 - 1979, and in an email exchange he kindly provided information about Fred, as well as this photo of a swan he made under Fred's tuition at RCA. Some very similar swans appear amongst the objects at the end of the film. William describes Fred as 'one of the finest craftsmen ever to walk the earth. He had no artistic ability but, boy could he make glass'. He would say, ''there's only one way to do this, Bill, an' that's the right way". "Fred was a classically trained glass-maker and taught me to make glass in the traditional way. He taught me to gather properly, and if you can't gather, you're wasting your time. Go back to the beginning and understand what's going on on the end of the iron and WHY. I'll always be in his debt as he taught me properly." "I got dead lucky as I spent a lot of time with him, sitting behind his bench watching his every move and he relating to me what was going through his mind. He would say things like 'Be brave, do all the work in the 'ole..(glory hole) an' if you cut in 'ere, you'll get a noice fine rim...he had a thick north London accent, so think of how you would mimic a cockney and you're nearly there! I emailed William back to explore how Fred might have sounded if the film had had a soundtrack. I asked if a 'thick North London accent' might sound a bit like English actor Dennis Waterman, seen here on TV in Minder and New Tricks. William's response was "brilliant, Dennis Waterman's is typical of the classic London accent!" So now we can imagine Fred's voice as we watch the film. Fred stayed a month in Inglewood in 1977. But when Tony Kuepfer was involved in preparations for the NZSAG Conference to be held in Inglewood in April 1983, he made sure that Fred was one of the invited international guest lecturers / demonstrators . They were a distinguished bunch: as well as Fred there was Makoto Ito (Japan), Marvin Lipofsky (USA), Johannes Schreiter (Germany), and Australians Peter Minson and Keith Rowe. I blogged about the conference in 2012; Fred appears at the right in both the group photos I published there ( http://newzealandglass.blogspot.co.nz/2012/08/nz-society-artists-in-glass-conference.html ). In these photos taken at the Conference by Tim Edwards, Fred, behind, is watching Peter Minson, while in the detail from the group photo the parking sign arrow points him out. As he had done in 1977, Fred made pieces for sale in 1983 to help defray the costs of his participation in the Conference. This platter, not unlike some we see being made in the 1977 film, found its way into my collection by way of TradeMe in 2008. Following the 1983 Conference, Fred spent some time at the Hot Glass Company in Devonport with Peter Raos and Peter Viesnik, and they too very much appreciated the opportunity to learn from such a skilled craftsman. After 1983, Fred did not return to New Zealand, but he and Tony kept in touch. 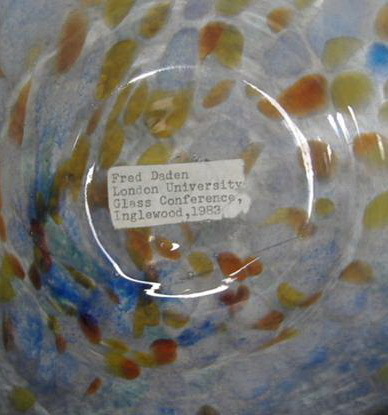 Fred did come back to this part of the world, since in January 1987, AusGlass held its 5th National Conference in Melbourne, with 'overseas guest Fred Daden (hot glass)'. Tony and his mother (who had developed a warm friendship with Barbara Daden), went to see Fred in Melbourne during AusGlass.The families exchanged Christmas cards for a number of years, before losing contact in more recent times. Sadly, Fred Daden died at home in London in November 2013. I am very grateful to those who have provided information to assist in the production of this blog. However, responsibility for the content and any errors rests with me. Fred checks dimensions, stands and turns to tap punty to release goblet. Tony hands Fred a second punty, takes pipe while Fred adds glass for foot (camera watches Fred’s fingers rolling the pipe – Fred’s fluid, skilled glass-maker’s hand movements are featured throughout film). Fred uses handle of tongs to make cross mark in glass on punty, a technique that leaves a distinctive ‘Maltese Cross’ punty scar, often used by collectors to distinguish Tony Kuepfer’s post Daden glass. Film pans around the works on the shelves. There are a couple of swans, typical of factory ‘homers’, such as made in Christchurch and at Hokitika, but very typically Whitefriars. Pieces have adhesive price stickers. A platter, a stoppered decanter. I'm a collector, not an artist!